Some of you got this!!!! You guys are awesome!!!!!!!! The blue arrow points to the styloid process which is a bone of the skull which can be elongated like this in up to 4% of the population!!!! This can just happen with age and most people will not show any symptoms. A physician name Dr. Eagle has described a syndrome called "Eagle Syndrome" in which the styloid process is elongated in patients and causing symptoms such as pharynx, face, ear pain and headaches. This is a rare finding, but this skull and many other rare skulls can be seen on display @muttermuseum!!!!!! 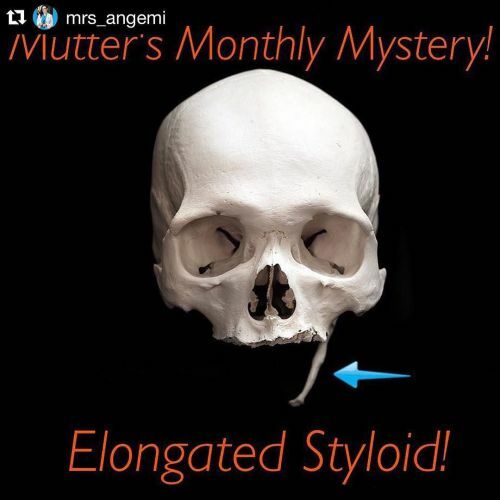 #iheartautopsy #mmm #müttersmonthlymystery #mütter #müttermuseum #healtheducation #skull #skulls #styloidprocess #eaglesyndrome #pathology #mysterydiagnosis #philadelphia #philly" By muttermuseum on Instagram.